Given the amount of time that most people today spend viewing computer screens, eyestrain is becoming increasingly common. In this video, Marc Grossman, OD, LAc, holistic developmental/behavioral optometrist and licensed acupuncturist, suggests a visual hygiene program that includes the following four exercises. First, if you have been looking at a computer screen for more than 20 minutes, gently rub your palms together to produce mild heat and cup your hands over your eye sockets for 30 seconds to relax your eyes and reduce eyestrain. This exercise has the added benefit of activating relaxing acupressure points around the eyes. 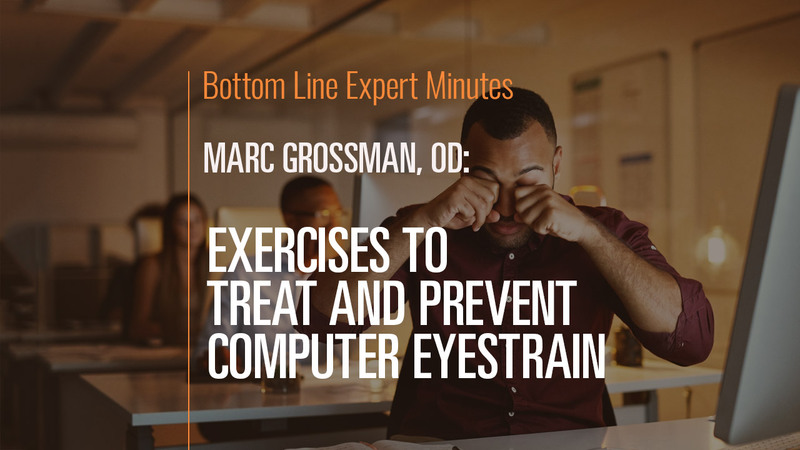 The second exercise to reduce computer eyestrain is let your eyes trace figure eights in the air slowly and easily while breathing comfortably, working often neglected eye muscles. The third exercise works underused eye muscles by shifting focus from near to far objects and back again. Fourth, Magic Eye books can be used to relax both the eyes and the mind. Finally, be sure to step away from the computer frequently and stretch your entire body.